East Brunswick Vo-Tech is working to reduce its environmental impact, improve the health and wellness of its students and staff, and include sustainability in its curriculum. 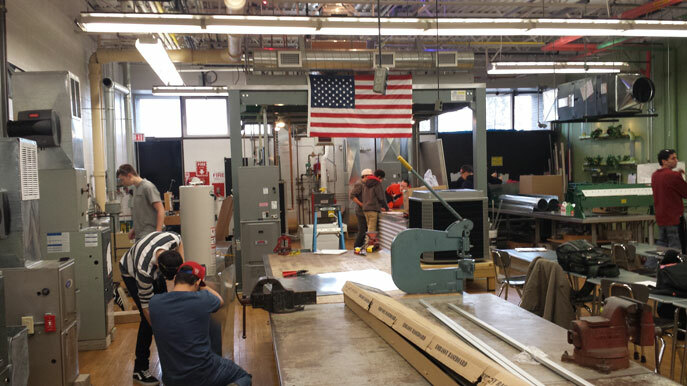 In recognition of its commitment to going “green,” the high school, one of the Middlesex County Vocational and Technical Schools, has been named a New Jersey Green Ribbon School. Selection was based on three pillars of achievement: Reducing environmental impact; improving health and wellness, and initiating an effective environmental and sustainability curriculum. Efforts to lessen the school’s carbon footprint include an energy audit, installation of water bottle refilling station, and students’ growing food for use in culinary classes, the cafeteria and at area food banks. Wellness efforts include a fitness challenge and an annual 5K race. Among the curriculum efforts are the addition of a college-level course, in conjunction with Stockton State College, called “Principles of Sustainability,” and units on sustainability added to other courses. The Middlesex County Vocational and Technical School District, which is celebrating its centennial during the 2014-15 school year, includes seven schools on five campuses, in East Brunswick, Edison, Piscataway, Perth Amboy and Woodbridge. Named a New Jersey Green Ribbon School, March 2015.